Shihan Juan Carlos Escalera – 6th dan. He was born in Logroño the 30th of March of 1961 Master of Human Sciences, University of Zaragoza 1982-85. Master of Sports Sciencies, University of La Rioja 1992-95 He began to practice Kyokushinkai Karate in 1977 in Karate Kan Club in Logroño. He obtained the first Dan in 1982, the second Dan in 1985, the third Dan in 1988, the forth Dan in 1993, the fifth Dan in 1999 and the sixth Dan in 2008. Shihan Cyril Andrews 6th Dan. Studied Kyokushin karate for over 40 years, and he is one of the true Kyokushin pioneers. 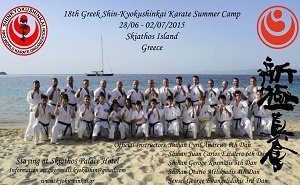 Andrews has also been one of the regular guest instructor at the Greek camp. He is also highly desired by many countries each year, which tells us what qualities he possesses. Great Kyokushin nations as Bulgaria and Romania have had him as a guest in recent years.